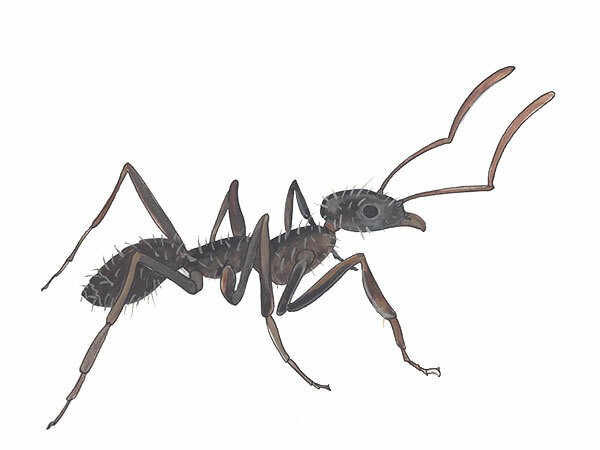 Crazy ants are dark colored pests that range between 2.3-3 mm in length. Their heads are brown to black and the rest of their body has a small hint of blue mixed with black. Their legs and antennas are exceptionally long. They have tiny white hairs scattered around their bodies. The crazy ants name originated because they do not trail in a line like most ants, instead they move in rapid and irregular behavior. Crazy ants are not native to the United States but have quickly become a common pest to Florida, California and other parts of the country. The crazy ant is mainly a tropical pest but is very adaptable with its habitat and can live in either dry or moist environments. Colonies are extremely portable and can be relocated easily if they find a habitat less desirable. In their natural habitat, crazy ants prefer to nest in dead or decaying wood, under logs or stumps and in the soil beneath large rocks. When humans are present, crazy ants can be found nesting in ornamental plants, pots, wall voids, subfloors, piping and behind cabinets. One of the most interesting aspects known about the crazy ant is their ability to inbreed with each other. Crazy ants are able to mate with their siblings without showing any genetic deformations. The queen produces offspring throughout the year as does her genetically cloned children. The male and female gene pools stay separate. The process is known as double cloning and it has facilitated the growth of the crazy ant population throughout Florida. Crazy ant colonies are moderate to large in size with as many as 2,000 workers. Crazy ants are omnivores; consuming fruits, vegetables, plants, honeydew, insects and human food. Crazy ants can be picky eaters; during the Spring and Autumn they eat sugar-based foods and during the Summer they prefer a high-protein diet. The first step to ant control begins with removing ideal habitats. Eliminate all organic material on the ground thats not necessary. Remove tree limbs, leaf piles and brush. Trim tree branches and shrubs off the structure to deter ant activity. Like many pests, crazy ants prefer moist environments. Fix water leaks and improve draining if at all possible. Exclude the home by caulking cracks and installing weather strips to doors. For indoor treatment, chemical applications or baits can be successful. For outdoor treatments, granular baits and sprays are ideal. Always read the label or consult an expert before performing pest control treatments. Having an issue getting rid on ants? We are the local experts in ant control and prevention. Call us today for a free quote. We make ant problems go away. We service Sarasota ant control, Siesta Key ant control, Longboat Key ant control and surrounding neighborhoods.